A grizzly on Swan Lake Flats in Yellowstone National Park. On June 22, the Interior Department announced that the Yellowstone grizzly bear will no longer be listed as an endangered species. The bear has been listed for 42 years, despite multiple efforts to remove Endangered Species Act protections. The move could allow hunting of the grizzly – a decision will be left up to the states. “This is good news for the Yellowstone grizzly and good news for the region’s ranchers,” Craig Uden, president of the National Cattlemen’s Beef Association, and Dave Eliason, president of the Public Lands Council, said in a statement. 1. Tribal nations fight removal of grizzly protections Tribal nations in the Northern Rockies have promised to fight for continued protections for the bear. In October 2016, members of the Cheyenne, Blackfeet, Eastern Shoshone and Northern Arapaho tribes signed the Grizzly Treaty, committing to restore and revitalize the threatened grizzly bear across North America. 2. How did we get here? Brush up on the long road to delisting, which began with the grizzlies’ precipitous population decline in the first half of the 20th century. 3. State management plans could allow hunting The delisting places management of the bear in the hands of Wyoming, Montana and Idaho, including decisions about hunting and habitat conservation. Last year, states dusted off old plans for bear management, in anticipation of a delisting decision. 4. Wildlife advocates have prepared for this for a long time Some Yellowstone grizzly defenders have fought a delisting for decades. Meanwhile, some managers say the delisting is a victory, an indication that the long-imperiled bear is on firmer ground. 5. 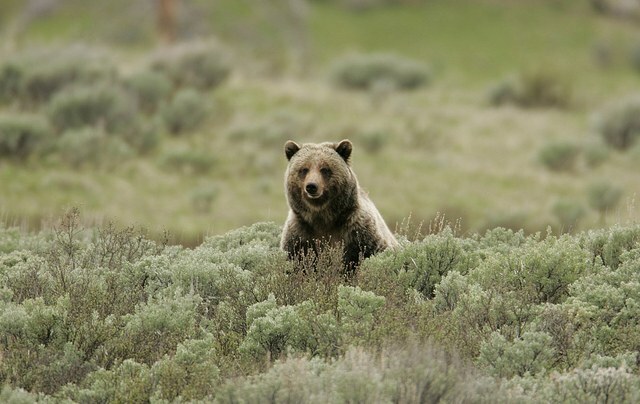 A longtime defender explains the essentials Ever since she first saw a grizzly bear while backpacking in Wyoming’s Absaroka Mountains in the early 1970s, Louisa Willcox has been fascinated by them. Other than stints in outdoor education and journalism (including an internship at High Country News in 1979), Willcox has spent most of her professional life at the center of grizzly bear conservation in the Northern Rockies. Here’s what she thinks you should know about grizzly conservation.